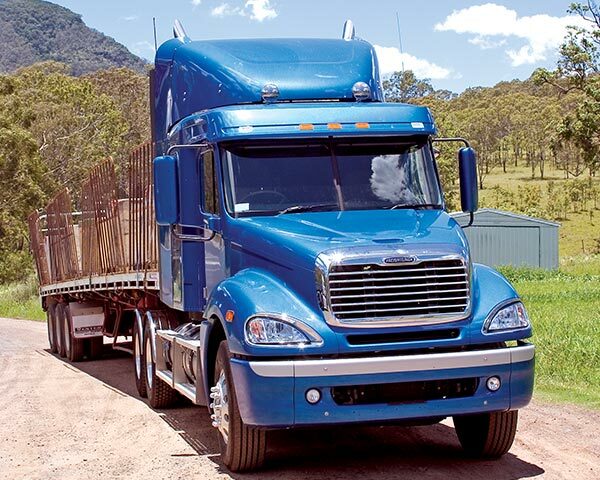 The first Freightliner Columbia trucks began to arrive in Australia in the middle of last year. It aims to fill the gap between the company’s Century Class highway prime movers and smaller vocational applications to be covered by the new Sterling HX models due here later this year. The Columbia comes in two forms the CL112 and CL120; the smaller of the two featuring a 112 inch cabin and the larger a more substantial 120 inches. The CL112 is destined for distribution and intrastate work while the CL120 has more of an emphasis on the longer highway applications. Engine choices in this first batch of models are limited to traditional Freightliner choices of Caterpillar C 12 in the CL112; and C15, Series 60 and Cummins ISX for the CL120. The coming year will see the introduction of the MBE 4000 engine. The in-line six cylinder MBE 4000 is a Mercedes Benz engineered US-style engine made in Brazil. It will also be arriving here later this year in another form, the OM475, fitted in the new Mercedes Axor. For the purposes of this test the CL112 is fitted with an Eaton Autoshift gearbox. 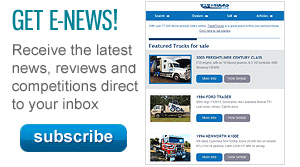 The Autoshift is receiving increased acceptability among US truck buyers here in Australia. The CL120 also drives through an Eaton Autoshift as opposed to the more normal 18-speed Roadranger. Jumping into the cab the impression is of a nice big sleeper cab. 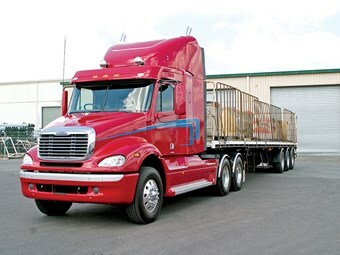 There is plenty of head height and the typical Freightliner fixtures and fittings are well laid out. There is no other way to describe the exhaust brake on a Detroit except loud, which can be intrusive inside the cab. Of course, this is a matter of taste. Many would complain if it wasn’t loud, but it’s also well known that noise is a contributory factor to fatigue. On the CL112 the Cat’s engine brake makes less noise but is also much less effective. Storage available from the driver’s seat is limited. There is nowhere to put all of those things needed on the road and very little handy storage for a driver’s bits and pieces. In the CL112, it’s worse. If a driver were to live in this cab, some storage space would need to be added. Overhead lockers can be reached from the seat, but are so small and not all that useful. A large open shelf is located above that, but it not accessible from the driver’s seat. A concern in the cab is the plethora of plastic panels and fittings they do seem very robust and could develop internal rattles after a couple of rough trips. The sun visor on the CL 112 is already developing a rattle — it’s a US fitment that could find the relentless vibration from Aussie highways too much to bear. With the change from right to left hand drive the engine tunnel impinges on the left foot’s space and it is quite cramped in the foot well. This is not a concern in these models as there is no need to constantly work the clutch pedal — only when setting off and stopping. The models fitted with a manual transmission may prove awkward for drivers with a large shoe size. The CL112 in the test is fitted with a 430hp Caterpillar C 12, while the CL120 comes with a Detroit Diesel Series 60 rated at 500 hp and 1850 lb ft of torque. Due to loading limitations, the CL112 pulled a total of 37.5 tonnes, while the CL120 ended up hauling a less realistic 34 tonnes. This meant the Series 60 was never called upon to use all of its considerable power for a prolonged period of time. In general, however, the little 430 hp Cat handles single trailer work well and is more than adequate for its application. In the CL120 the 500 hp engine, Autoshift and light single trailer combination sees the truck cruise effortlessly in rolling country. Cruise control makes the whole job effortless for the driver as well. The task of climbing Cunningham Gap is simple in automatic when there’s 500 hp on tap pulling 34 tonnes. However, experience with the Autoshift in situations where quick responsive gear changing is demanded has shown that it can be a bit sluggish when speed is of the essence. When climbing a steepening grade, I believe it is safer to turn all of the automatics off so that the driver can make down changes. The control for the Autoshift is Freightliner’s own Smartshift, which consists of a paddle with a switch on the end (to choose the mode — reverse, neutral, drive or low speed). Pushing the paddle away chooses a downshift, while pulling it towards you upshifts. This paddle is one of the best things Freightliner has done with the Autoshift. A quick flick with the finger is a lot easier to do quickly than finding the correct button on a control pad. When setting off there is a wait getting it into gear as the driver presses the clutch, selects drive and then has to watch the gear indicator until an arrow disappears to show that the gear is engaged. This can take some time. Taking off in Autoshift can be a bit sluggish as it trundles through every gear. It stays in gear too long and will not skip shift enough. The best results come from flicking it into manual and skip shift quickly all the way up through the bottom box. When up to reasonable speed, just flick it back into auto and it takes over from there. The weakness seems to be in the level of information getting back to a box that does the simple things well. When brought it to a halt the box will always set off again in 2nd gear. It does not choose any other gear, even if running bobtail, and will only skip shift properly when going down hill. This is where the European manufacturers and their proprietary engines and drivelines have the edge over the Americans. Computerised boxes need lots of information so that precise gear changing can be affected and take into account the road conditions at the time. The Freightliner is also offered in the US fitted with the ZF Meritor Freedomline box, which is actually the superb ZF AS-Tronic engineered for US tastes. 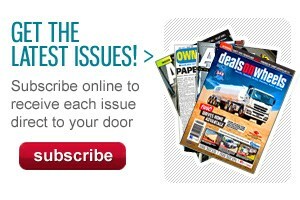 Why can’t Freightliner bring in this box with their trucks and really compete head on with the Europeans? On Cunningham’s Gap, the CL112 handled the climb relatively easily going uphill at 1700 rpm at 38 kph. It felt comfortable in 12th gear and that is not a bad performance for this size engine. The CL120 never went below 50 kph all the way up the climb but was baulked by road works just before the top so any figures for timing the Gap were lost. Taking off uphill it was possible to get back up into 14th gear before the top; grabbing a gear just before the final part of the climb to pull over the top with ease. Autoshift works well when it has the extra power of the Detroit compared to the Cat C12 in the CL112. On the rough roads on Darling Downs the driver is insulated well from the state of the road. 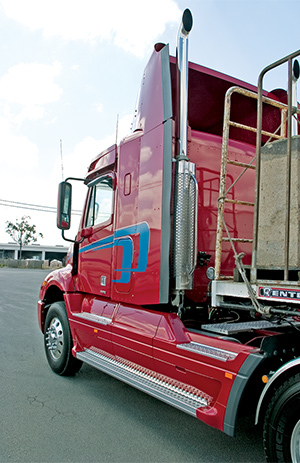 It is normal to notice some awkward rocking in an American truck but the combination of air suspension and an air seat on a relatively long chassis makes for a comfortable ride. The suspension takes out the bumps quite well — although not in the Volvo-Scania-Mercedes Benz class. The CL120’s extra chassis length compared to its shorter sibling gives it a nice balance. The Ezy Rider seat that’s fitted in these new models delivers a smooth ride that feels luxurious and very comfortable. Instead of just rocking up and down they move backwards and forwards as well. This may sound uncomfortable but it is in fact quite pleasant. The armrest fitted to the seat is okay as long as the truck is not a manual. It could get in the way when you are fighting with the Roadranger gearstick. Unfortunately, the whole effect is ruined by the seat belt, which is anchored to the B pillar and not integrated into the seat. Despite a high level of driver comfort in the seat a rough road makes the belt lock up and pull at the driver’s neck and shoulder. It can be quite uncomfortable at times. The indicators are silent — there is a flashing light but that’s it. This driver left the indicator on for half an hour at one point. The rear view mirrors are excellent. They are more European in styling, encased in a shaped moulding and easily adjusted. In this case the main mirror is adjustable electrically but the wide-angle spotter has to be set by hand. The spotters are very good and work well in awkward situations on a truck with no rear window. The decision to bring these trucks in with modern aerodynamic mirrors as opposed to the West Coast style mirrors is a good one. They are more fuel-efficient and trucks don’t have to look like something from the sixties in the 21st Century. Visibility all round is good in the CL112. It has a short bonnet and relatively high seating position, with windows low enough to get a view. Also, there is a down facing mirror on the passenger door ideal on a distribution truck. The design does have some small faults. These are big rear view mirrors that are close to the A pillar, which limits visibility when looking from the driver’s seat. Even with the one on the driver’s side it was noticeable that a driver may not see some things first time because they were behind the mirror. These two Freightliners prove to be easy and comfortable to drive and perform well on the highway and in the city. 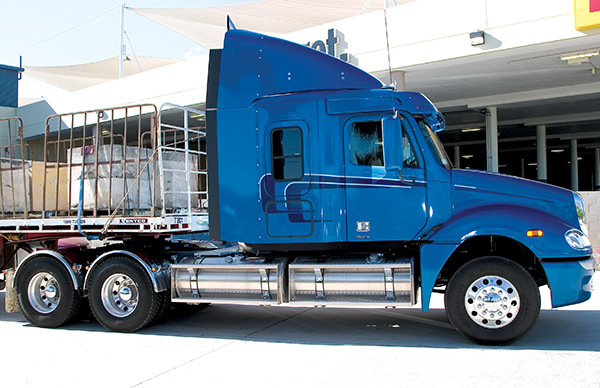 They are a modern truck with a modern look but they also push the right buttons for the Aussie truck buyer with a very American styling and US driveline.